Three workshops. One fabulous weekend! 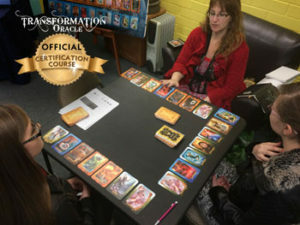 This 3-part intensive workshop takes you deeply into a journey of metaphysical growth through the Transformation Oracle card deck. We’ll be doing WORKSHOP I, WORKSHOP II, and WORKSHOP III. Take any one workshop, or all three to become a Certified Reader. Note: This workshop attracts LIGHTWORKERS. Join us! Beginners, intermediates & experts welcome. Required for all CERTIFIED READER candidates. *Please register online and save! Think about it… after one class, most people stay! "I went into Sonya's Transformation Oracle workshop as a total beginner. I was a little apprehensive about walking through the door, yet the cards and the class kept calling to me! I'm so glad I went. Sonya conveyed the information needed to get started beautifully, and I left feeling empowered that not only did I have a good feel for what I was doing, but that my gut instincts could be trusted as well. Thank you!" "The workshops were packed full of information, beautifully presented, and encouraged interaction. Hearing a variety of perspectives and interpretations from all the participants allowed me to expand my understanding of both the cards and the layouts." "During the Transformation Oracle Certification Workshops, time was suspended and the wealth of information poured flawlessly. We were encouraged to ask questions and interact by reading cards with a partner. And, we changed partners, so we could interact and learn, with and from, each other—an irreplaceable experience!" Click here to learn more about scholarships. Click the “Apply for a Scholarship” button below when you are ready to apply!